Jason Narducy and Jon Wurster have long been part of a varying group of musicians who have played with Bob Mould and post 2009 they’ve settled into a seemingly solid, old fashioned power trio which is now delivering its fourth straight album. 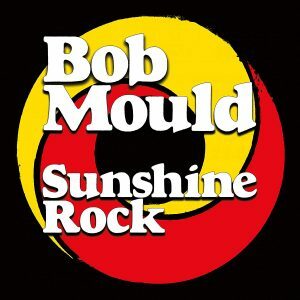 Mould had described the previous 3 releases as a trilogy (Silver Age, Beauty & Ruin, Patch the Sky) and I’d love Sunshine Rock to amusingly be album 4 in a trilogy but it is more standalone than epilogue. Patch the Sky was a more sombre ride than the previous two releases following the loss of Mould’s mother. Sunshine Rock, as the title suggests is somewhat of an antidote to this. As a man facing his sixties and the recent passing of Grant Hart, his creative counterfoil from Husker Du days, Sunshine Rock bathes in the sunshine while still wearing rain-soaked clothes. Thankfully, the album doesn’t contain any metaphors quite as strained as the one you just struggled through in the previous sentence (except the Polar Bear one in ‘Sunny Love Song’). Written in Berlin, recorded in San Francisco, quite often the lyrical themes are at odds with the summery titles. Sunshine Rock is, in Ron Manager parlance, an album of two halves. Side one will blow away any residual cobwebs you have whilst side two still cranks the volume but is slightly less in your face. The title track and lead single opens the album and, at first, it’s a breezy heartfelt ride with the top down that brings to life a hopeful love, calling in imagery about being someone’s astronaut, but it belies a fear of loss. As is common with Mould’s lyrics, repeated listening reveals slightly less optimism than is first conveyed. For the last minute, strings which have been hiding amongst the arrangement come to the fore and lift the song to its widescreen conclusion. ‘What Do You Want Me to Do?’ contains the sort of vocals-follow-the-riff chorus that makes it immediately bombastic – it seems a likely candidate as a live favourite. ‘Sunny Love Song’ brazenly contradicts its title and tone with some extreme wintry imagery before the cathartic nature of songwriting, and writing sunny songs in particular, becomes a reason for sunny celebration in itself. ‘Thirty Dozen Roses’ recalls Mould’s Sugar era in places with an emphasis on a fairly modal riff that opens out into a bawled tale of olive branches, apology chocolate boxes and being a “lousy prick to you”. Talking of Sugar (Mould’s 90s band), there’s a slight hark back to the era’s production of having vocals embedded in the mix with the guitars rather than dominating. ‘The Final Years’ is the first track not to open with loud six string chords – a synth string line starts as the main riff before it develops into an answer to the vocal melody. A melancholic meander that the endemically middle aged track listing benefits from. A hover of regret that looks to a mortal sunset. ‘Irrational Poison’ reintroduces sweeping flanged guitars that eventually fall into an outro battle with counter-melody strings. ‘I Fought’ is a familiar stomp of a song with a ballsy central riff that holds sway throughout and an combative arm-linking chorus that fades out in a swirl of descending, delayed cacophony. ‘Sin King’ is a jab; The lines “I know one thing about ya, babe / You’re sinking our democracy” could suggest it’s the current occupant of the White House but less barbed lines later in the song suggest it’s probably someone closer to Mould. The guitars drive a skipping rhythm which is buried in guitars, dipped in a guitar sauce and topped with a swampy guitar garnish. There’s a whole battalion of Bob’s guitar tracks on pretty much every song but, for whatever reason, on ‘Sin King’, the layering effect absolutely soars. Certain guitar lines steal your attention before disappearing back amongst their multi-tracked brethren. ‘Lost Faith’ has a mournful pace in the verses with a descending two string riff over the chord sequence that blossoms into a chorus featuring an almost Motown drum beat. The strings throughout become more funereal at the outro, making the transition into ‘Camp Sunshine’ all the more serious sounding in subtle juxtaposition. ‘Camp Sunshine’ includes the most childlike imagery on the album with song writing and jamming equated to a childhood summer camp where “we play all day and then / We get some sleep, do it all again”. Despite the main guitar track being obviously electric with hints of chorus and reverb, this was definitely a song written acoustically and the arrangement keeps it anchored in a world of virtual campfires without ever feeling like it’s going to burst into a refrain of ‘Kum Ba Yah’. ‘Send Me a Postcard’ is a cover of the Shocking Blue song that maintains some of the loose drumming vibe of the original but ups the tempo slightly which suits the flow of the record at the cost of a little bit of the blissed out garage feelings of the original. The most well-known Shocking Blue song to be covered is Nirvana’s version of ‘Love Buzz’ – this version of ‘Send Me a Postcard’ is fairly thrilling but it isn’t going to burn into a mass of consciousness in quite the same way. Sunshine Rock bows out with ‘Western Sunset’ – a track with enough trebly guitars and a mid-paced wall of sound to keep any Mould aficionado happy. It finishes, similarly to the opening track, with the rest of the instruments peeling back to reveal a warm, optimistic orchestral section held together by a cello. In a flipping of the old adage about the month of March, Sunshine Rock comes in like a lion and goes out like a lamb – here the lion’s roar is worse than its bite and the lamb is a benevolent old ram.